This mod is no longer maintained because I don't have the time to give it the proper love it needs. Feel free to take over development (it's open source). Or use one of those other IRC bridge mods (like Thump). 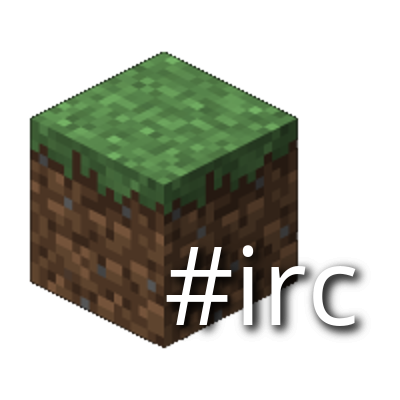 IRC Bridge is a Forge based server-side only IRC Bridge mod that will connect one or multiple IRC channels to a Minecraft server chat. It is the successor to EiraIRC and this time, is founded on a few simple goals to keep its development on track. When you say server side only... single player does have a server, so does it work in SP mode if you configure it for that internal server? As someone helping a server admin get started I'd like to test the configuration we plan to use in single player and tweak it as needed. You should probably go with another IRC mod (Thump maybe? ), I'm about to drop support and devleopment on this one. Sorry :D But to answer your question, it's locked to dedicated servers only. Getting a screwed up unicode character after the first letter of everyone's name showing up in IRC. Some people see it differently, e.g. the pictures above. In weechat in my terminal it looked like a blank space. The iRC channel is on irc.rizon.net if that makes a difference. Minecraft version 1.9.4. Let me know if you want a modlist or something. If this is a server-side only mod, does that mean that I have to separate server from client in order to use it, even if I play single player only? It's made for server chat relay, not IRC chat for singleplayer. It just continues on with "at usersnaspshot at hashcode at channelsnapshot at hashcode" etc ad infinitum. It looks like some sort of infinite recursion? In any case, the server continues to run after this, and strangely enough the irc relay seems to work after this for relaying minecraft messages to IRC, but not IRC messages to minecraft, nor does it respond to commands. This should be fixed in the latest build now. Also if you have huge pieces of a log file like above, please use something like pastebin instead of embedding them in the post. It makes the post more readable and spams the comment section less (since CurseForge sadly doesn't have an auto-collapse/expand feature). Stupid Minecraft Realms. Fixed in latest version up now.